Open Date 5000 Series automatic hot foil overprinters | PAK Automation Ltd. The Open Date 5000 Series automatic hot foil overprinters are high quality heavy duty machines. 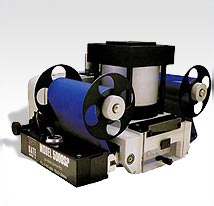 They are designed to be attached to reel fed packaging machines providing a large area on-line printing facility for logos graphics, dates, bar codes etc. Given their large print area, 5000 series printers can also span multiple lanes on sachet and labelling machines enabling a single printer to be used instead of one smaller printer per lane.